It is not every day that you get the chance to see a hummingbird’s nest. 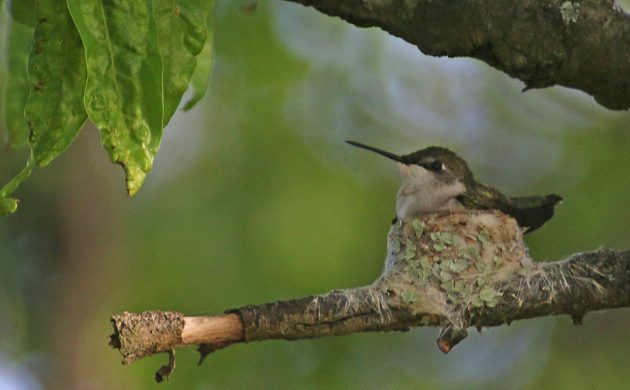 And it is even less frequent in New York City where we only have one species of hummingbird, the Ruby-throated Hummingbird, and they don’t nest very often. When they do nest it can be difficult to track down the nest’s exact location or you might figure out where the nest is but be unable to get a good look at it because it is too high or obscured by foliage. Fortunately for me, a kind birder pointed out a ruby-throat in the process of building a nest at Jamaica Bay Wildlife Refuge last week and the nest is relatively low and unobstructed. This weekend I returned to the scene to find the bird spending lots of time sitting on the nest – possibly incubating eggs – though she didn’t seem entirely satisfied with the status of her nest. 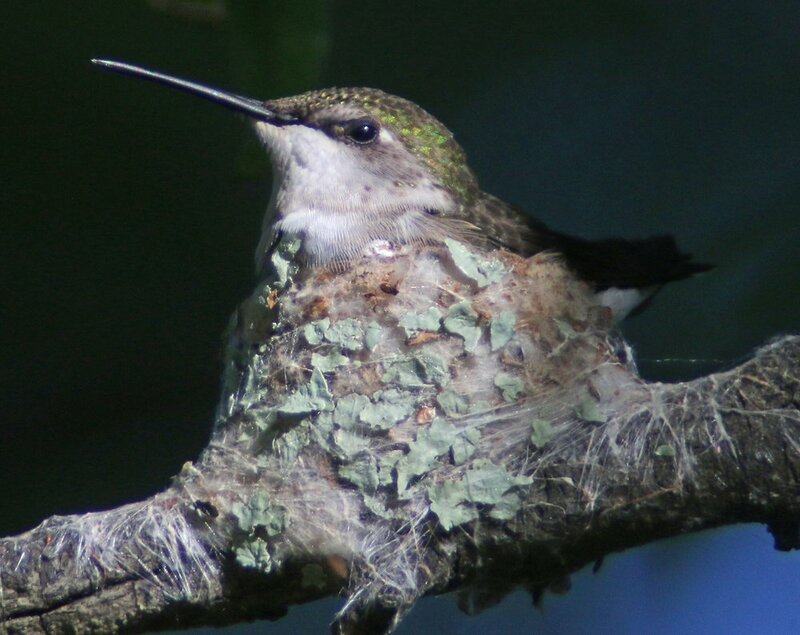 Ruby-throated Hummingbird nests are built with a base of spider silk, which they use because as the nestlings grow the silk will expand to give them more room. Plastered around the outside of the nest is lichen, used for camouflage. A completed hummingbird nest resembles nothing so much as a knot on a branch, completely innocuous unless you know what you are looking at or get lucky enough to see the hummingbird land on it. 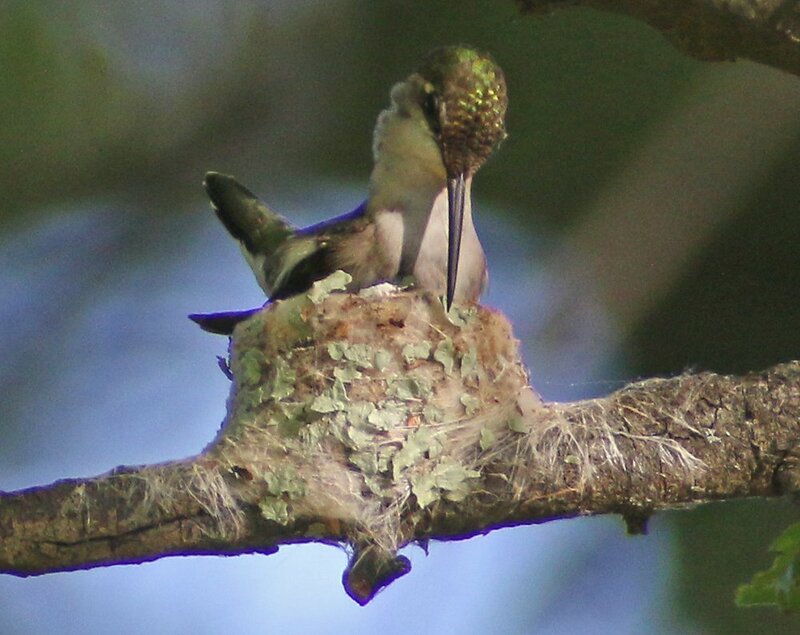 In this heavily cropped shot you can see the hummingbird adding a piece of lichen to the outside of the nest. At the beginning of the video the hummingbird is busy adding more spider silk to the nest. I plan to take full advantage of the presence of this hummingbird nest and will hopefully get the chance to check up on it often. How cool would it be if I manage to get video of her feeding youngsters? On my second pass at the nest on Sunday morning I remembered that my Swarovski digiscoping rig can zoom. This shot was taken at about 60X magnification and is slightly cropped. I only managed to zoom that much because later in the morning the nest gets some direct sunlight. Below is some video at a higher magnification than the first one. How many species can you identify singing in the background? She sits tight in this video. Check out how her head-shape changes when she moves her feathers. I can’t wait to check back the next time I get a chance! Make sure to swing by 10,000 Birds for updates! Very Cool!!!! I hope she has more success than the one in Forest Park a few years ago. We were so excited to have a hummer nest in FP, but sadly predators got it. I hope this one will be successful! German birders have a saying “A nest found is a nest lost” since mammalian predators have a tendency to follow human scent trails because that is where food is often found, and then they find the nest. Hopefully that will not be the case here or was not the case in FP. I don’t think it will be an issue here as the shots were taken from a busy path and the undergrowth beneath the nest – which is about 20 feet up – should prevent anyone from getting too close. Interestingly, the Forest Park nest was directly over a path and also pretty high. But it would make sense that mammals would use that trail, I just don’t know if using the trail would be what led to something getting the nest. The Snow Bunting That Almost Killed Me, or, Hyperbole in Bird Blog Post Titles is Fun!